This weekend, Saturday 30th June & Sunday July 1st, Dundrum Town Centre will host a beauty extravaganza for all of us besotted by beauty. ‘Defining Beauty @ Dundrum Town Centre’ will run on both days from 12 noon-7pm on level 1 of the centre. Keep reading for more details and to find out about a special giveaway for Irish readers of Fluff and Fripperies. Not in Ireland? Skip straight to this earlier post. Get involved ahead of the event for a chance to win some gorgeous beauty bits – just head to www.facebook.com/dundrumtc and www.twitter.com/dundrumtc, select what you want to see on the ‘Defining Beauty’ stage, and keep your fingers crossed! Benefit, Eve Lom, Laura Mercier, Urban Decay and more will all be on hand to showcase the latest trends. 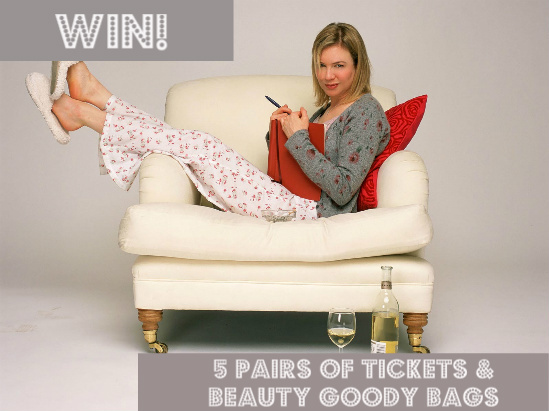 And to celebrate the Defining Beauty event, Fluff and Fripperies has 5 pairs of tickets to give away to an exclusive screening of Bridget Jones’s Diary at Movies @ Dundrum (Friday 29th June 6.30pm). Winners will also receive a Dundrum goody bag containing beauty booty from brands like L’Occitane, Maybelline and Elemis. To enter, just follow the directions below - the only mandatory step is to leave a comment below, though there are a couple of options for additional entries. Good luck! For more details check out the website. www.dundrum.ie. Adore Bridget Jones.... She's amazing lol. looks like a great prize! Would love to win. I love love love Bridget Jones! Would love this fab treat. John Rocha worked with Mia, didn't he? I hope I have that answer right! This is a cool prize! I'd tweet only I'm not on twitter! Line is in the water... so fingers crossed! Fab Prize Emma! Thanks for hosting this giveaway. Would love to take my wife out to the cinema.